Do you live outside the United States? If so, please use our International Donations form or download and mail in our donation form. Become a CPT12 insider! We won't bore you, spam you, or give out your address. Your gift of $0.00 will be divided into 2 equal payments. Your first payment of $0 will be processed immediately. Your second payment will be processed on 25th of next month (or the first business day thereafter). Your gift of $0.00 will be divided into 12 equal payments. The first payment of $0 will be processed immediately. The following 11 payments will be processed on 25th of each month (or the first business day thereafter), beginning next month. Reap the rewards of being a member! With a CPT12 MemberCard, you receive 2-for-1 discounts and other special offers at hundreds of restaurants, museums, theaters, retail outlets, family-friendly attractions, and more! 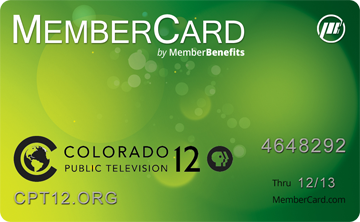 Simply contribute $75 or more to receive your CPT12 MemberCard, valid for one full year. Now you can use your iPhone and Android devices to find available discounts and redeem offers directly on your phone! Not only can you use your smartphone to find available discounts, you can also show your phone on the spot to redeem the offer – no need to carry a card with you.